I want others in my community to join my walk to help raise awareness and bring hope to all those in the Redding area who are affected by ET. This March, the International Essential Tremor Foundation (IETF) invites the community of Redding, Calif. to celebrate National Essential Tremor Awareness Month by hosting a fundraising walk at 10 a.m. on Saturday, March 14 at Clover Creek Preserve located at 3500 Shasta View Drive. Participants can register at http://www.essentialtremor.org. March is National Essential Tremor Awareness Month, an important time for people of all ages, from all walks of life, to walk together to increase awareness of the most common neurological movement disorder in their communities. It allows everyone to share their story, make connections and keep the conversations going. Essential tremor (ET), which affects nearly 10 million people in the U.S., is the most common neurological movement disorder, but is frequently misdiagnosed as Parkinson’s disease. The condition is often characterized by rhythmic, involuntary and uncontrollable shaking of the hands and arms, the head, voice, legs and trunk during movement, making daily tasks difficult if not impossible. While not life threatening, ET is a serious and progressive condition that can significantly affect a person’s quality of life – socially, professionally and emotionally. At this time there is no cure for essential tremor. The local ET Awareness Walk will join communities all throughout the country to fund tools and support for healthcare providers, the public, and those affected by ET and research to find treatment options, the cause and ultimately, a cure for this life-altering condition. Rhonna Stacher’s personal connection to ET drives her to raise awareness in her local community by organizing an ET walk in the area, “I want others in my community to join my walk to help raise awareness and bring hope to all those in the Redding area who are affected by ET,” said Stacher. Walk registration requires a $25 donation and comes with a complimentary event T-shirt for participants to wear throughout the year in an effort to raise even more awareness about ET. 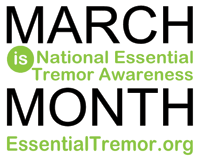 For more information or to register, please visit http://www.essentialtremor.org. Headquartered in Lenexa, Kan., and founded in 1988, the International Essential Tremor Foundation is the leading organization in the world dedicated to those affected by essential tremor. The mission of the IETF is to fund research that will find the cause of essential tremor and lead to better treatments and a cure, increase awareness about ET, and provide educational materials, tools and support to healthcare providers, the public, and those directly affected by ET. The IETF has distributed more than $750,000 in research grants, to fund 30 promising studies, in the search for the cause of ET. The Foundation has hosted numerous community awareness events across the U.S. to provide those affected with the basic knowledge necessary to become their own advocate when seeking treatment. And, the IETF also provides assistance to a vast network of support groups around the world. To learn more about essential tremor and the IETF mission, visit the IETF website at http://www.essentialtremor.org.